Who’s not sharing EU clinical trial results? US pressure on Ecuador to drop its support for the World Health Assembly Resolution. There has been an unprecedented amount of media coverage about this story (over 600 online editorial articles and about 900 social media posts) After the well researched front page article in the New York Times (online on Sunday 8th July, hard copy 9th July) the story was boosted by President Trump tweeting that it was all ‘Fake News’. Here are just some. First a great summary on The Late Show with Stephen Colbert Jul 11, 2018. Click HERE for more and HERE for the latest. CLICK HERE for just some of the US coverage. Interference in public health policy: examples of how the baby food industry uses tobacco industry tactics. Learning from the tobacco experience, this paper assesses whether the baby food industry uses any of the six tobacco industry interference tactics recognized by the World Health Organization (WHO) and summarizes examples of documented evidence. The rise in fortification interventions since the establishment of the Scaling Up Nutrition and the Global Alliance for Improved Nutrition (GAIN) has been dramatic – and has given the ultra-processed food corporations a big boost. 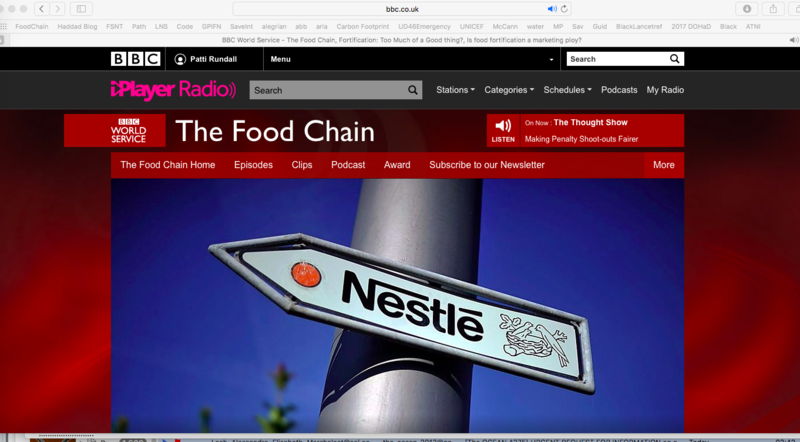 BBC World Service broadcast a programme today in its series: The Food Chain. In Fortification: Too Much of a Good Thing? presenter Emily Thomas did some great interviews: Nestlé tried to pretend that its fortification claims were not really selling points, that noodles are better than crisps, that if you add vegetables they are ‘home made’ and that post-market surveillance of impact is too tricky when there are so many products on the market; Lawrence Haddad (CEO of GAIN) claimed many things including that having junk food companies on its Board didn’t really matter because GAIN’s agenda is set by hundreds of other people, Mark Lawrence, Public Health Nutritionist, Deakin University, Australia and Prof Barrie Margetts, Southampton University gave great summaries of the rise of voluntary fortification – how the onus has shifted to public health bodies to prove harm, how the risks of fortification – especially on junk foods – might outweigh any benefits and could be displacing wholesome foods. Gordon Paulson from the Federation of Master Bakers clarified that by law in the UK no nutrition claims are made on bread that is fortified by law – since all the products are the same. 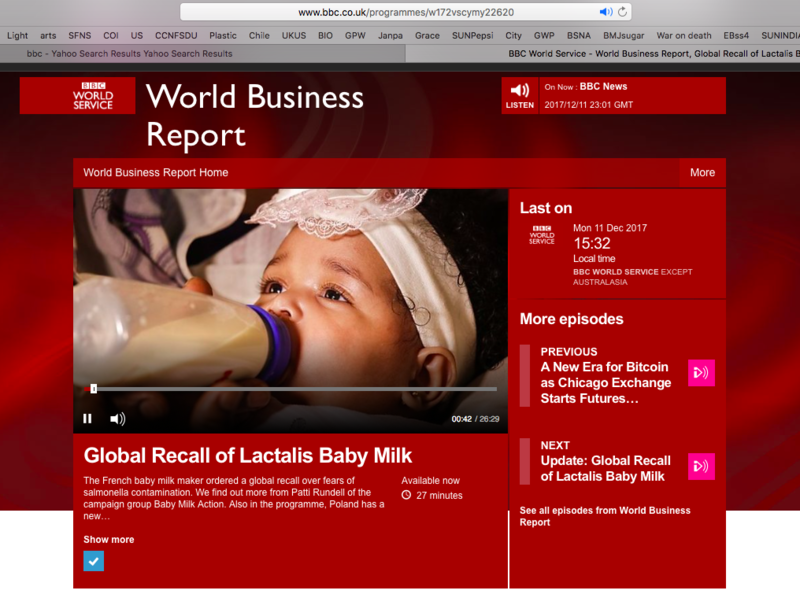 30 July 2014 – Nutraingredients: Baby Milk Action quoted in article on Danone rapped by the Advertising Standards Authority for misleading claims. You will find links to earlier media coverage on the related press releases in our archives.